WINONA, MN USA – ( March 4, 2014) – Global custom engineered thermoplastics compounder RTP Company continues to strengthen its wear and friction compounds by introducing APWA Plus™ compounds – the latest advancement in its family of wear and friction acetal (POM) compounds. RTP Company has long been a leader in this field which includes a strong portfolio of acetal grades utilizing PTFE, silicone and other internal lubricants designed for optimal performance and cost control. Acetal used in these compounds can utilize either homopolymer or copolymer resin, the most commonly recognized resin trade names being Delrin* and Celcon*. 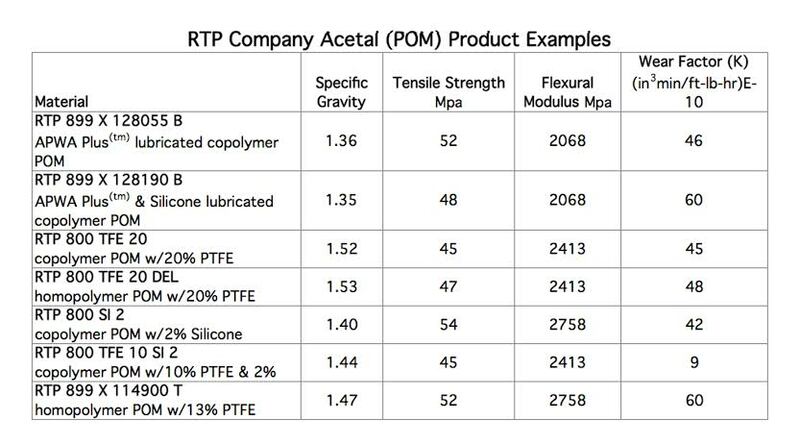 “As RTP Company does in all of its compound technologies, our wear and friction resistant compounds benefit from our ability to draw upon the widest range of resins and additives to provide optimal customer solutions.” said Gregg Newby, Global Business Manager for Wear and Friction Materials at RTP Company. RTP Company’s new APWA Plus compounds are innovative products that provide numerous benefits over other wear resistant compounds. APWA Plus compounds utilize a proprietary polymeric alloy to improve wear and friction resistance resulting in moving and sliding parts with longer lifecycles and reduced maintenance costs. APWA Plus compounds will not plate‐out, preventing mold corrosion and frequent mold cleaning which results in production downtime. APWA Plus compounds contain no PTFE, are 100% halogen‐free and are fully compliant with RoHS regulations. Using the proprietary alloy as a lubricant results in a lower specific gravity and a more stable lubricant raw material supply which contributes to the competitiveness and reliability of APWA Plus compounds. Additional benefits include colorability and FDA compliance. APWA Plus compounds are commercially available in additional resin systems commonly used for wear resistant applications such as polyamide (PA) and polycarbonate (PC). RTP Company can utilize our custom compounding expertise to meet the performance criteria of specific applications with additional enhancements such as color, conductivity, flame retardant, high temperature, and structural additives. For more information on RTP Company’s APWA Plus compounds, please call (507) 454-6900, or visit www.rtpcompany.com.